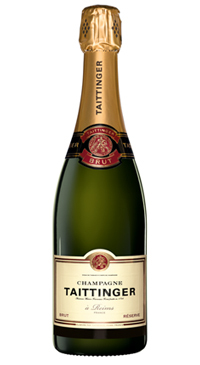 Taittinger is a blend of Chardonnay wines (40%) and Pinot wines (60%) from 40 different vineyards and matured to perfection. Such a high proportion of Chardonnay is seldom found among the great Champagnes. The colour is brilliant, golden straw yellow. The bubbles are fine. The mousse is both discreet and persistent. The nose, very expressive and open, is both fruity and bready. It exudes aromas of peach, white flowers (may blossom, acacia) and vanilla pod. On the palate, this lively fresh wine is at once in harmony. This is a delicate wine with flavours of fresh fruit and honey.